It was the final day for the Spring Series. The rain came down all morning and most of the afternoon, but the RC Lasers were determined not to cancel do to a little rain and temps in the 40s. 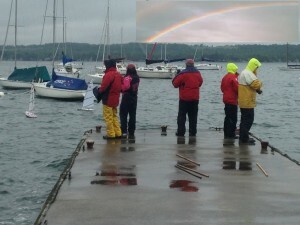 All those in attendance came with foul weather gear and “THE MITT” for their transmitters. To help us on this journey was Anne’s hot coffee, Glennis’ banana bread & cookies, and some of The Admiral’s finest wine. At 4pm there was a little drizzle but within minutes (as predicted by the Admiral) the rain halted and it was on to meet the challenge. There was a great deal of sail switching throughout the afternoon between the A & B sails. The course was square and we would have windy lews twice around with a windward finish. In the first five races there were 5 different winners, but it was the sixth race that carried the “POT of GOLD” for Terry Schmidt. After racing well in all her races for the day it was the victory in the last race of the spring meet that put her 2 boats in front. CONGRATULATIONS TERRY!!!!!!! RESULTS (There was some talk about someone else tuning her boat before racing but unless there is a formal protest it will not be pursued.) On the down side though, 30 seconds comes off her start time. Next Sunday we will begin our 8 week Summer Series off the south dock CYC from 4-6PM.